Purchase wholesale socks & wholesale underwear from D&W Sourceall, Inc the best online source for affordable items. Become part of our family today. The girls will love these wholesale socks. They will look super cute and the socks will fit just rig..
Wholesale underwear for young girls. This assortment includes a combination of cute prints in differ.. Younger kids will love these socks. They look and feel great, we believe they might become their new..
Wholesale Socks for all ages.Size: 9-1180% Cotton 20% SpandexMachine Wash WarmCase of 12 Dozen..
Wholesale Affordable SocksGirls Socks80% Cotton 20% SpandexSize: 9-11Machine Wash Warm, !.. Wholesale Socks for all ages.Size 9-1190% Cotton 10% PolyesterCase of 12 Dozen..
Wholesale Socks for all.Size 9-1180% Cotton 20% SpandexCase of 12 Dozen.. Size 9-1190% Cotton 10% SpandexCase of 12 Dozen.. Size 9-1180% Cotton 10% Polyester 10% SpandexMachine Wash in cold Water.Case of 12 Dozen.. 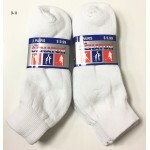 Size 9-11 Socks80% Cotton 20% SpandexCase of 12 Dozen..
Teenagers will love these wholesale socks. They look and feel great, plain white socks for any event.. Size LargeCase of 12 / 10 pks..
Men T-Shirts $29.00 Each Dz. 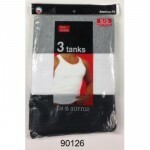 Men Tanks $20.00 Each Dz. Men's Boxer Briefs $18.00 Each Dz. Men's Large Briefs $17.50 Each Dz.